Lovers of The Lord of the Rings will be familiar with talking trees and now Cumbria has its very own in the shape of a talking yew tree and we have to thank actor Brian Blessed for the voice! On the south west shore of Lake Windermere just north of Newby Bridge, you will find Great Knott Wood, a precious area of ancient woodland. A real survivor in the wood is the veteran yew that had to be rescued from being engulfed by a neighbouring Norway Spruce. Brian was delighted to be asked to help – the wood is run by the Woodland Trust as a restoration demonstration site to educate and inspire visitors’ understanding of why ancient woodland is so important and what better way to do this than to use a talking tree. “When the Woodland Trust asked me to help with this project there was one, clear answer,” says Brian. “What better thing to lend my voice to than an old yew tree, just a stone’s throw away from the edge of Lake Windermere? Creating a persona for this veteran being, and bring it to life was an offer I couldn’t refuse,” he continued. Brian hopes the tree and the story it tells, will shock, captivate and inspire visitors to Great Knott Wood for many years to come. 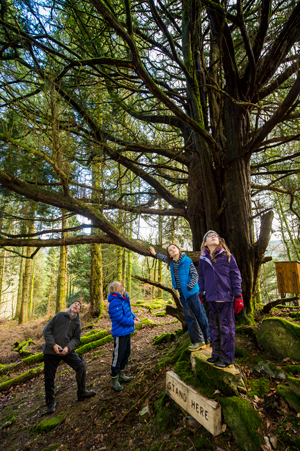 Recordings of the actor’s voice have been fitted inside the tree and visitors are able to learn that the tree has been there for hundreds of years as the woodland has been looked after by people, but later too many planted trees had blocked out the sun for the yew, before the Trust thinned out the wood as part of its restoration process. Heather Swift, site manager, is delighted that Brian has given his distinctive voice to this wonderful tree: “It’s really fantastic to have such high profile support for our restoration work and exciting to see people’s reactions when they first discover the amazing talking tree,” she said. “Great Knott Wood provides a glorious backdrop to the beautiful lakeside scenery and is an intriguing, delightful wood to explore. It’s been loved and worked in for centuries. Now everyone is welcome to visit the new trail and enjoy features like the talking tree,” Heather continued. Ancient woods are a vital part of our history and natural landscape. These precious, irreplaceable habitats have been in existence since at least the earliest reliable maps were published – 1600 in England and Wales and 1750 in Scotland – although many are centuries older. Soil in ancient woodland is unique and contains fungi, insects and nutrients, some rare plants and fungi rely on its ecological value to grow and survive. Today, ancient woodland is facing increasing threats and covers only 2% of the UK. Almost half of what remains is in need of restoration as a result of being planted with non-native conifers and the spread of invasive species such as rhododendron, which can cause damage to the existing wildlife. Thanks to National Lottery players, a £1.9 million grant from the Heritage Lottery Fund is being used by the Woodland Trust to carry out a UK wide five-year project to restore areas of damaged ancient woodland by gradually thinning out conifers and allowing light to reach the floor to encourage native species to flourish. The talking yew is bound to be a big hit with visitors to Great Knott Wood but the important message it will carry cannot be underestimated.